Have you ever noticed how quickly your bathroom becomes disorganized? No matter your good intentions, you will always end up with items strewn everywhere on your countertop, with your drawers messy and disorganized, and of course nowhere to put anything decorative. One easy, usually inexpensive solution is to install new shelving. There are so many options for shelving that you will easily find one that works for you, whether it's setting a couple of shelves high up or using those small corners with bespoke shelving, as in this ​small but practical bathroom by Wanda Ely Architect. As we will see in this gallery, shelving isn't only practical: it can also be fully part of your decor decisions. Unfinished wood has a farmhouse appeal, while glass or metal fit contemporary styles. If you don't have quite enough space to handle shelves that jut out of the wall, consider recessed shelving, as in this modern bathroom by Sage Design. Recessed shelving has the benefit of looking smooth and harmonious, and to actually expand a space visually, rather than make it a little more cramped as typical shelves do. The use of glass in this recessed space is especially effective to help with the opening up effect. Sometimes adding a small shelving unit can add a visual pop that brings a bathroom to life. This DIY bathroom reno by Keys To Inspiration has a modern vibe, but the light metalwork on the sides of the shelves add a light industrial touch that's definitely distinctive. The monochrome effect of white, gray and black works really well for this small powder room. We've already seen recessed glass shelves, but not in a marble surrounding:​ this luxury bathroom by VSP Interiors makes the best use of the transparency of glass to keep the beautiful marble grain uninterrupted. The mirror at the back of the recess enhances the light and makes the space appear bigger, too. Have a weird, shallow space in your bathroom you're not too sure what to do with? You could definitely put a cabinet there, but you can also install shelves. This minimal bathroom by ae design features three wide shelves in the same color as the wall, which helps keep the whole harmonious. Decorate with a few baskets for visual interest, and keep your stuff handy but also pretty. Don't want to make unsightly holes in your bathroom walls? Try this leaning ladder concept for over-the-toilet storage, by Anna White. The ladder can be made out of wood in any color or tint you like, and it's pretty solid. The three different shelf widths make it interesting visually, and it means you can keep things like towels and toilet paper refills right at hand. One way to capitalize on a large counter space is to add an open shelving unit that's standing directly on the countertop, as in this bathroom by Lind Nelson. The open shelving may not be the most aesthetically pleasing (at least if you like cabinet doors), but it's still super practical and can be beautiful if decorated properly. The custom shelving in this contemporary bathroom by Christopher Patrick Interiors looks a lot like the glass-doored buffets used in dining rooms. Two large drawers keep the things you want to hide out of sight, and the symmetrical shelving highlights the beauty of the items inside. This multipurpose shelf unit in a bathroom by ​Rise and Renovate adds a lot of charm and, of course, practical storage space. Put decorative items on the shelf top, things like toilet paper and hand towels in the baskets, and more things to hang. If you place this unit on a free wall rather than above the toilet, you can use the hooks for hanging bathrobes or towels. One way to integrate your shelves with the decor is to cover them in the same tile as your tub or shower area. 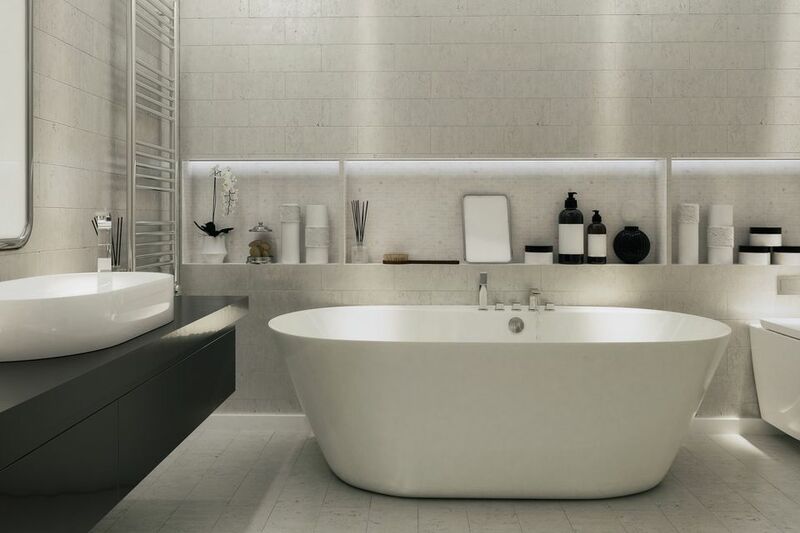 In this contemporary bathroom by Mascord, the two thick shelves feature the same sand-colored tile as the tub. Keep fresh towels and your bath items there to avoid cluttering the area around the tub. Two sets of thick wooden shelves replace the need for a cabinet in this spa bathroom by Veranda Interiors. The combination of warm, dark wood with clean white tile gives this space a Zen appeal while still being practical. A simple fern adds a touch of organic life. This beautiful renovation by Jenna Sue Design features a set of two hanging shelves with matte black supports, recalling the sink hardware and the light fixture above. Combined with soft beige shiplap and a reclaimed chest of drawers, this bathroom gives a comforting, welcoming vibe. This modern bathroom space by Stacy Graves Interiors features both recessed shelving and baskets to help with organization. This way, the shelving area never looks messy. Choose colorful baskets for extra decor appeal or a simple set of identical wicker baskets for something more harmonious and understated. Walk in an industrial or commercial area in your town any day and you will see at least one discarded wooden pallet, used to deliver goods. 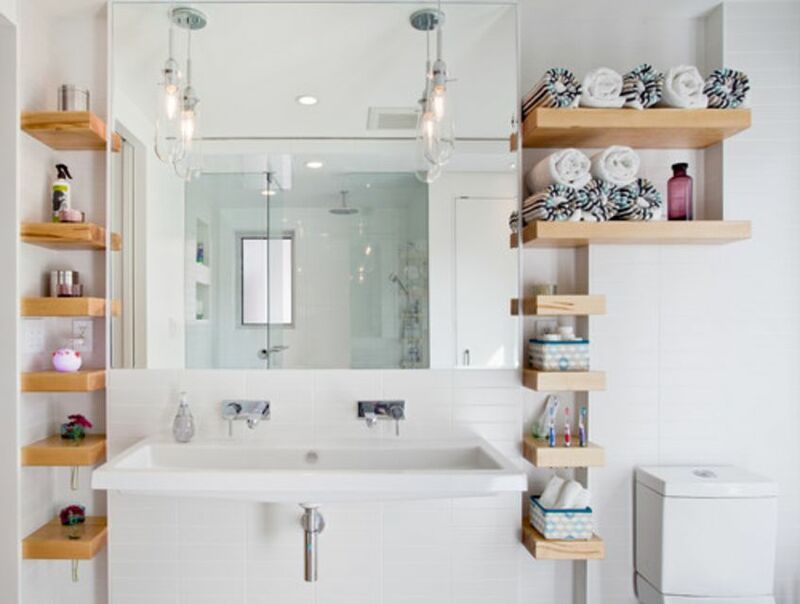 If you have some DIY talent, you can repurpose it as a set of shelves, as in this bathroom via HomeEdit. The wood is stained to add some depth, sealed to avoid any splinters, cut to the desired size, and installed on the wall.